AyrWritersClub | "You can make anything by writing" AyrWritersClub | "You can make anything by writing"
Membership of Ayr Writers’ Club gives access to meetings, invited speakers, feedback events, competitions, SAW school and so much more…. 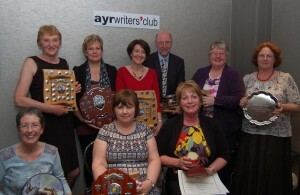 Founded over 40 years ago, Ayr Writers’ Club is one of the biggest and most successful in Scotland. Whether you have never written before or are a successful published author, new members are always welcome. Writing for Pleasure – and Profit! Would you like to see your work in print or broadcast on radio or television? Performed in the theatre or made into a film? Come and join us and learn the craft of writing.